For the uninitiated to this blog, I must tell you: I hate Italian restaurants. Yes, it’s true, I am Italian-American, but that may be exactly the root of my disdain. You see, I cook a lot of Italian food at home. And, 9 times out of 10, I find my rendition of a dish is far better than anything I order out. Case in point: The Original Benito One. Situated down on Mulberry Street in the heart of Little Italy, Benito One has been around since 1968–and it’s interior shows its age. With plastic grapes hanging from the wine glass rack, Italian flags posted about and a crooning bartender, Benito One is the kind of Italian restaurant you’d see in New Jersey. Or maybe the kind of Italian restaurant I’m used to seeing in New Jersey actually mirrors the likes of Benito One–a classic chicken-and-the-egg dilemma. At any rate, the restaurant’s somewhat tacky decor and fake-Italian waitstaff may enchant the 99% of clientele who are tourists, but it was lost on me. Don’t get me wrong. Benito One isn’t all bad. But it’s not all good, either. After about 10 minutes of waiting around, they served us loaf of Italian bread with tiny packets of butter in the basket; true Italian restaurants provide a dish of olive oil. A small detail, sure, but one that reflects the general approach of the restaurant–that is, inauthenticity. The eggplant rollatini we ordered for the appetizer was decent. 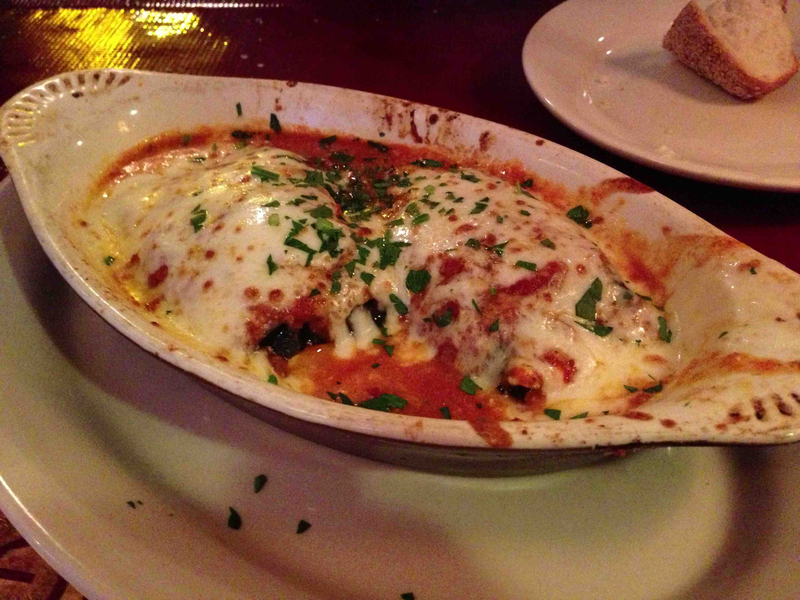 Thin slabs of eggplant were fried and rolled into mounds covered with mozzarella and marinara sauce. I enjoyed it, mostly because I don’t have the patience to make eggplant rollatini at home, so I have nothing to compare it to. As for the entrees, that was a different story. 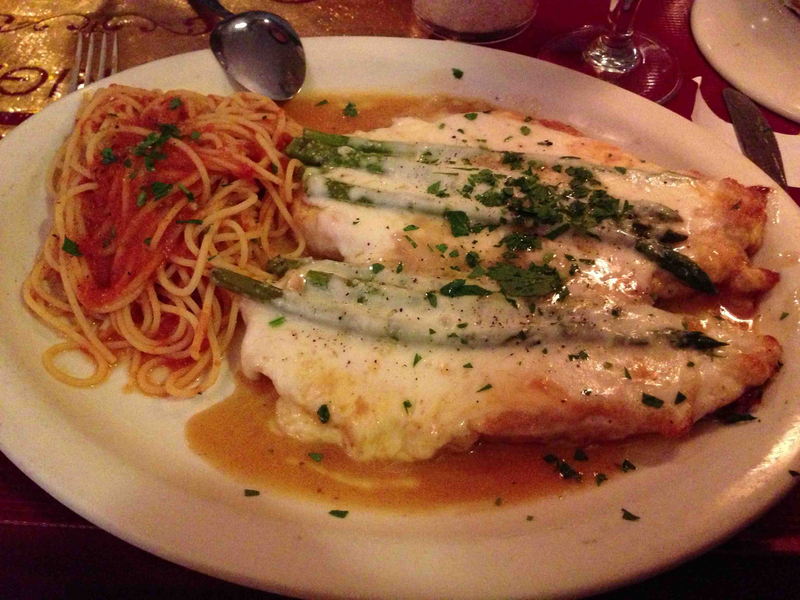 I opted for the chicken principessa, which was two chicken breasts covered with asparagus and mozzarella. I liked the way they prepared the chicken, which reminded me of how I make chicken francese: taking a chicken breast, dousing it with flour, dipping it in egg and then putting it immediately in the frying pan. The result is a delicious coating. The gooey mozzarella and crisp, thin asparagus nicely complemented the chicken itself. But I can’t say anything nice about the pasta they served alongside the chicken. The spaghetti was a bit rubbery and the marinara sauce lacked originality. Though I ate it anyway, I wasn’t impressed. I also never understand why Italian restaurants insist on serving a marinara pasta with a dish that clearly requires a cream sauce to accompany it. I digress. 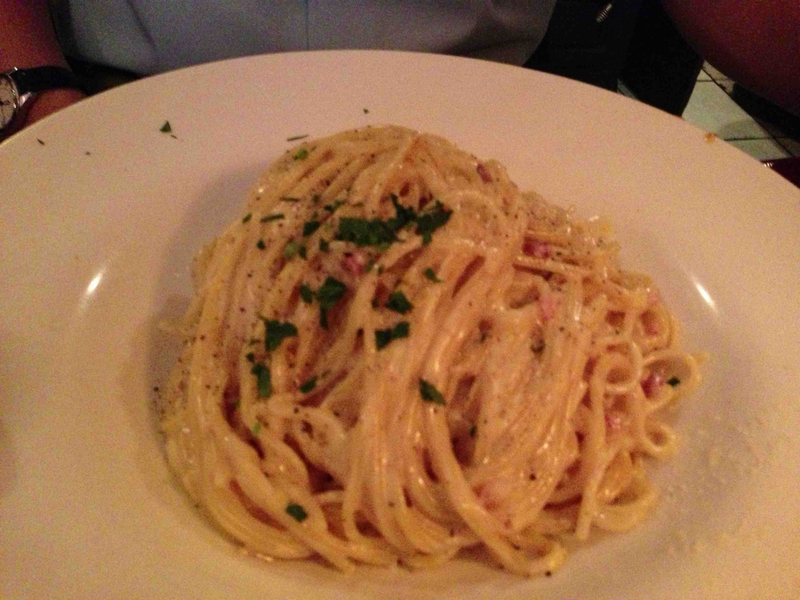 MDP got the spaghetti alla carbonara, which was served to him as a heap of tangled pasta in the center of a dish. He seemed to enjoy it, but I tried it and found the sauce to be too thick and there wasn’t even a hint of prosciutto/pancetta (I’ve seen recipes with either). I was kind of disappointed in his dish, but he ate everything. For dessert, we tried a cannoli, after about 10 minutes of waiting for the waiter to show us the dessert tray. I just called out “cannoli, please” and he finally brought one over. It tasted as though it had just been taken out of the fridge. I prefer when cannolis are near room temperature, as the shell tastes better when it’s not as cold. The filling was dotted with tiny chocolate chips, as expected, and possibly a bit of candied citrus peel. It was pretty good. So, if you’re in Little Italy, I recommend not going to any of the Italian restaurants. Benito One is probably the best you can get down there, and that doesn’t say much. Take a train to Canal Street, or take the 6 to Spring Street.